Unwavering business support demonstrated long-term commitment to South Africa and a willingness to cooperate in pursuit of national objectives. The Business Trust set out to mobilise and manage a larger pool of funding than had previously been raised for any privately funded development programme. That was done in the context of rising pressure to meet post-liberation expectations, a self-imposed structural adjustment programme to stabilise the economy, questions about the commitment of business and calls for reparations. South Africa was committed to building a free, fair and prosperous nation capable of meeting the needs of all of its citizens, especially the poor. It was understood in business and government that the voluntary commitment of business to South Africa’s shared development project would be underscored by an initiative that could be practically useful and symbolically significant. Over 12 years, 140 companies donated R1,2 billion against a prospectus that described the Business Trust’s planned work. This was over and above normal corporate social responsibility funding. The funds were raised in two funding cycles in 1999 and 2004. In each cycle the bulk of the funds were raised in the first year against letters of undertaking to provide funds over a five-year period. All undertakings made were honoured. This enabled the Business Trust to enter into long-term project partnerships and limit the time and money spent raising funds. Corporate funding was intended to provide an extraordinary contribution over and above the normal social responsibility funding of private companies. All of the participants in the Business Trust operated their own substantial social investment programmes. Corporate contributions accounted for less than 2% of total annual corporate giving in South Africa. A conservative investment policy generated R235,8 million in interest on corporate donations over the life of the organisation. The donors agreed to donate the capital sum and the interest thereon. By using its resources to accelerate the achievement of the agreed objectives, the Business Trust was able to leverage government’s investments in programmes like public works, infrastructure and crime reduction. Contributions were provided against a funding formula of 0,15% of market capitalisation (or 2% of after-tax profit) in the first phase, and 0,05% of market capitalisation (or 0,7% of after-tax profit) in the second phase. This resulted in a contribution of just over R100 million from the largest contributor and R2 500 from the smallest. All undertakings were honoured. Although it was not originally planned to attract government funding, the Business Trust managed increasing amounts of government funding for designated purposes. It was not originally planned to attract government funding for management by the Business Trust. However in the second phase of the work of the Business Trust it was agreed to manage government funds for designated purposes. 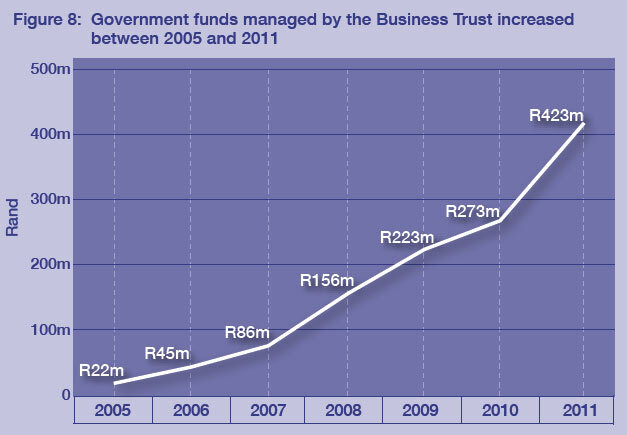 Funds managed in this way increased each year over the last seven years to total R423 million. These funds were used for designated purposes only, mainly in the tourism and business process outsourcing programmes. These funds were not used for general management or general programme development purposes. The government resources involved in the programmes undertaken were considerably larger than those provided by the Business Trust. Government funding in programmes like public works, tourism, schooling, infrastructure and crime reduction were all multi-billion Rand investments. The Business Trust was able to leverage those funds by using its resources to accelerate the achievement of the objectives set. The audited results for the final period 1 July 2010 to 31 December 2011 will be available in March 2012. The forecast for the full term of the Business Trust to 31 December 2011 is shown below. While the R1,8 billion managed by the Business Trust was a larger sum than previously assembled by a privately initiated programme in South Africa, it was small in relation to government budgets. Its value was that it could be rapidly deployed on focussed initiatives at the discretion of the jointly governed Business Trust board. The decision by a large number of firms to pool their resources in a relatively large fund enabled the creation of an organisation dedicated to the professional management of those resources. Unwavering business support demonstrated long-term commitment to South Africa and a willingness to cooperate in the pursuit of national objectives. Discretionary funding enabled the government to undertake the non-routine tasks that are required for bringing about change, but are seldom available. The funds pooled in the Business Trust added an important dimension to the substantial social investments made by the corporate sector. At less than 2% of annual social investment spending in South Africa, this funding enabled businesses to do together what they could not do alone. By combining the resources of business and government, the Business Trust was able to accelerate the achievement of national objectives for the benefit of society as a whole and especially the poor and needy people who participated in its programmes.